When you downsize by half as we did, it means editing your belongings and even what you consider to be ‘essentials’ out of necessity. What I discovered as I went through each item in our former spacious kitchen and thought carefully about what to donate and what to pack was a lot of excess, duplicates, and clutter. 15 Awesome Everyday Essentials for My Kitchen is a roundup of what made the cut because of its value to my everyday as well as new items upon which I now rely. Hello Lovely Studio. 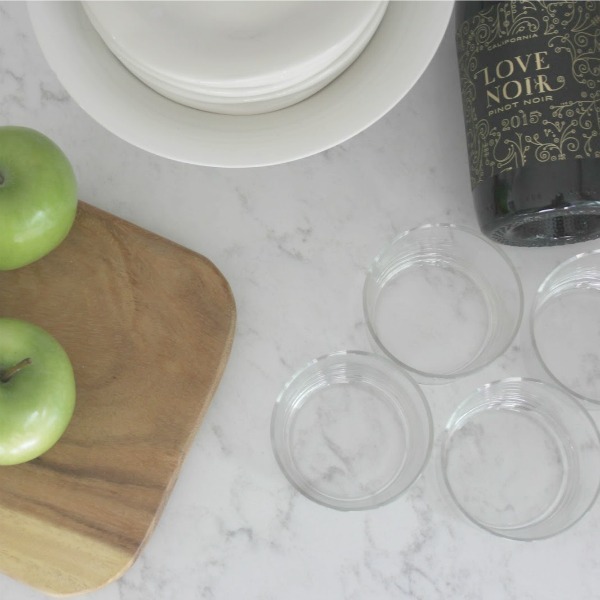 15 Awesome Everyday Essentials for My Kitchen…certainly lovely indeed. 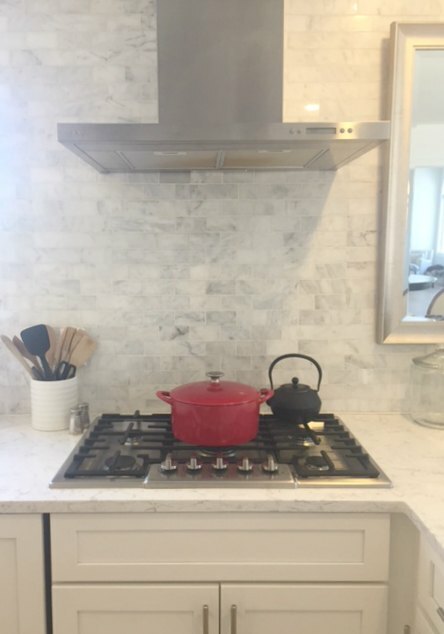 Get the look of my European country inspired white kitchen with these design and decor resources as well as inspiring photos and sources. 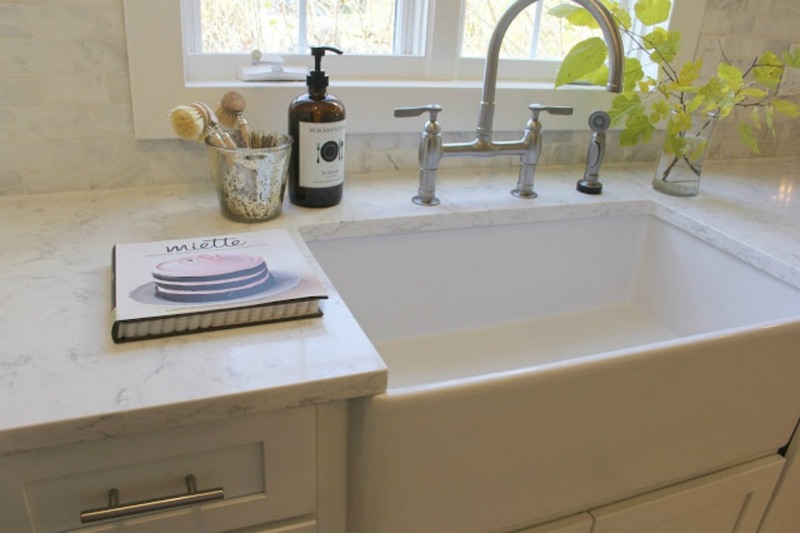 A white apron front fireclay farm sink is a kitchen design ingredient I dreamed about for years. This sink truly lives up to all the hype, and I highly recommend these good looking fireclay kitchen sinks for going beyond pretty. It makes doing dishes more pleasant while also standing up to abuse and adding vintage style character to a multitude of kitchen designs. Fireclay Apron Front Farm Sink: FIND HERE…certainly lovely indeed. Here are a few helpful tips I have learned along the way. First, like any kitchen sink, be sure not to leave anything metal lying on its surface for too long. If you forget, it may be necessary to scrub rust residue with a Mr. Clean eraser and perhaps a little iron-out. 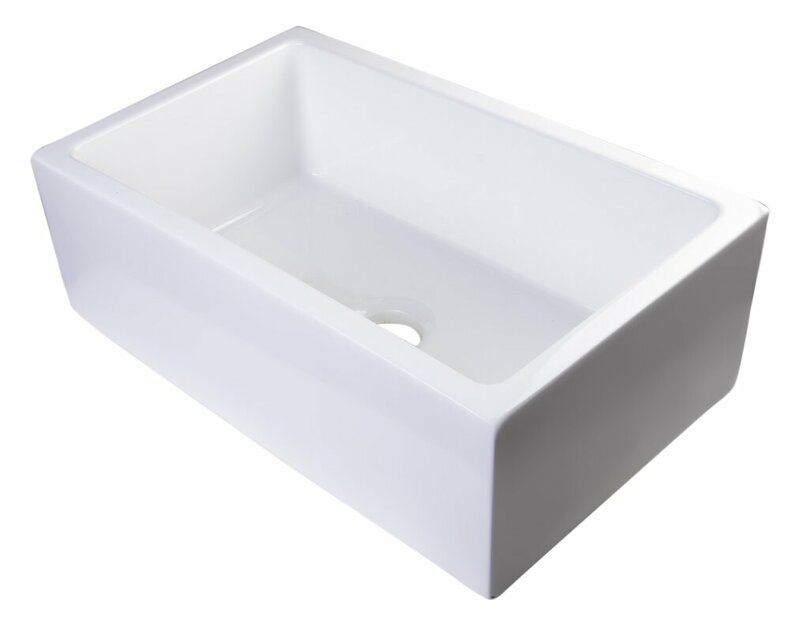 Secondly, although a fireclay kitchen sink is heavy von heavy, if you order one to be shipped, be sure to remove it from its packaging to inspect it thoroughly as soon as it arrives. Even if you won’t be installing it until a later date, it is worth the effort to check it for imperfections. My own sink (ordered from a different maker than the one below) arrived terribly bowed and un-usable. It was necessary to have a second farm sink shipped, and this caused a slew of inconvenience to the kitchen design. 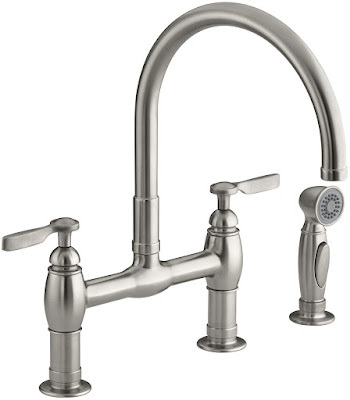 Bridge style kitchen faucets are a wonderful way to add traditional, good looking style to your kitchen. It was high on my must-haves since I desired a high quality, timeless, classically designed kitchen faucet to stand the test of time. The one I chose does not come cheap, but I have already lived with enough subpar kitchen faucets so I was prepared to invest in one that would go the distances. Bridge Kitchen Faucet: FIND HERE…certainly lovely indeed. I did a fair amount of extensive research to arrive at a decision about quart countertops for our kitchen. I settled on a product by LG called Viatera in the color MINUET. 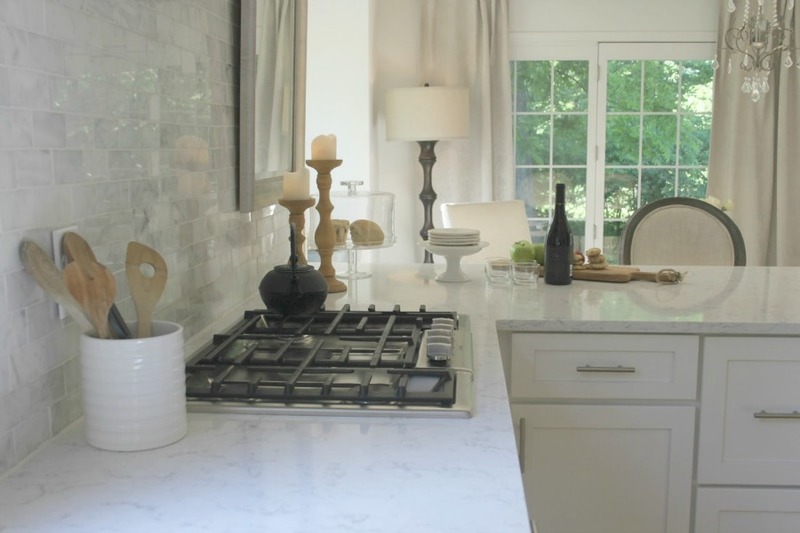 Home Depot is one source for Viatera quartz. 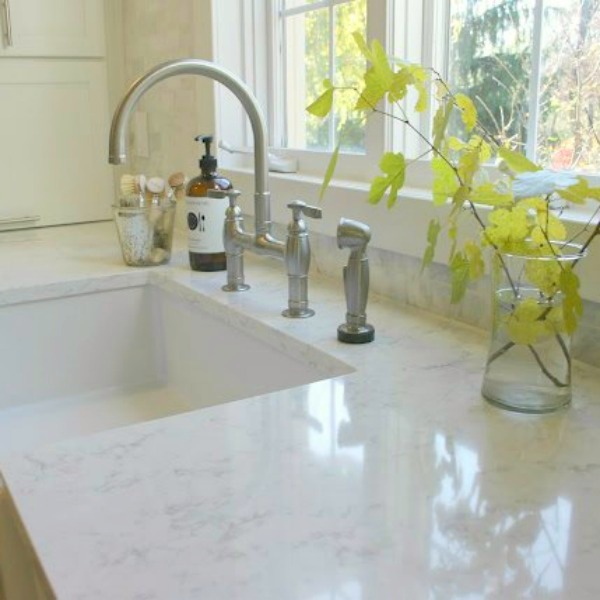 You can read about my preference for quartz RIGHT HERE. I deconstruct how I sifted through the myriad of options in the marketplace in this story. 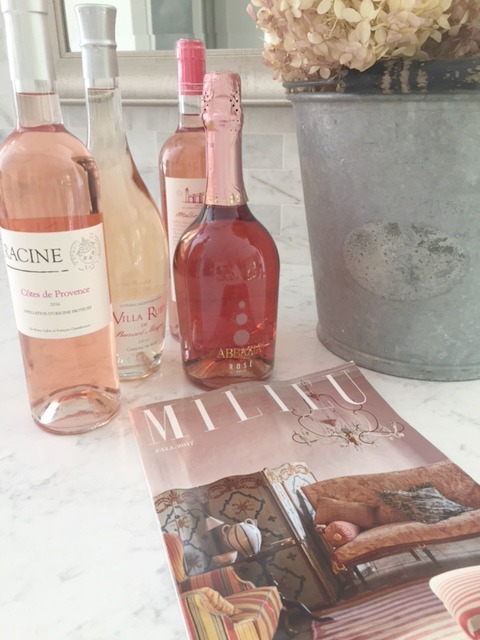 Milieu is an essential read in my kitchen! 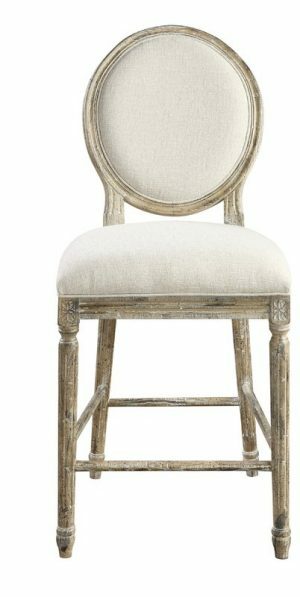 When you’re going for a European country or French farmhouse look, oval-backed Louis style counter stools, bar stools, or dining chairs may just help you snag the look. 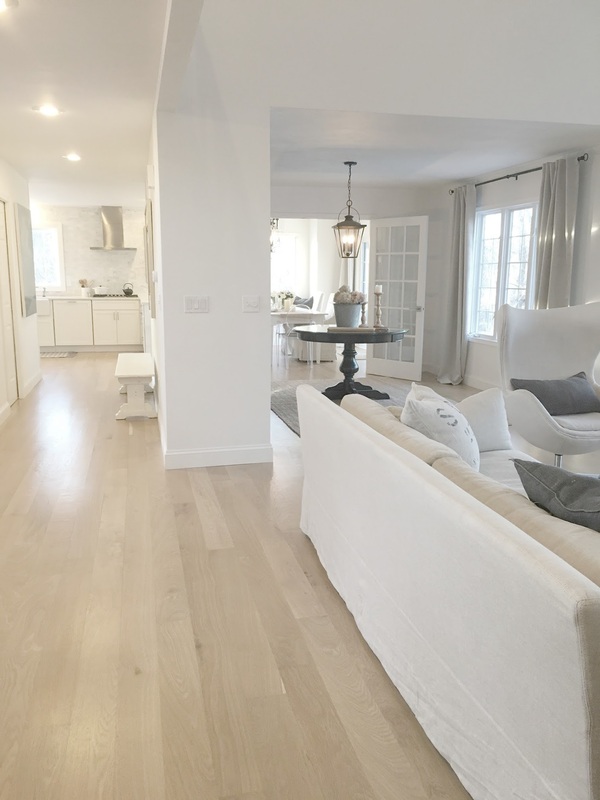 The Belgian linen upholstery is more durable and easy to live with than I can say…although if you have young children finger-painting in the kitchen, they are perhaps not the right choice! 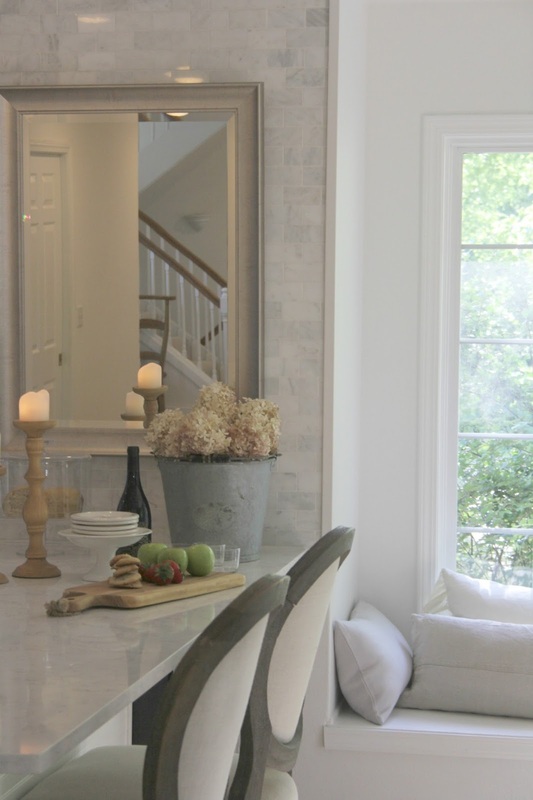 Louis Style French Country Counter Stools…certainly lovely indeed. 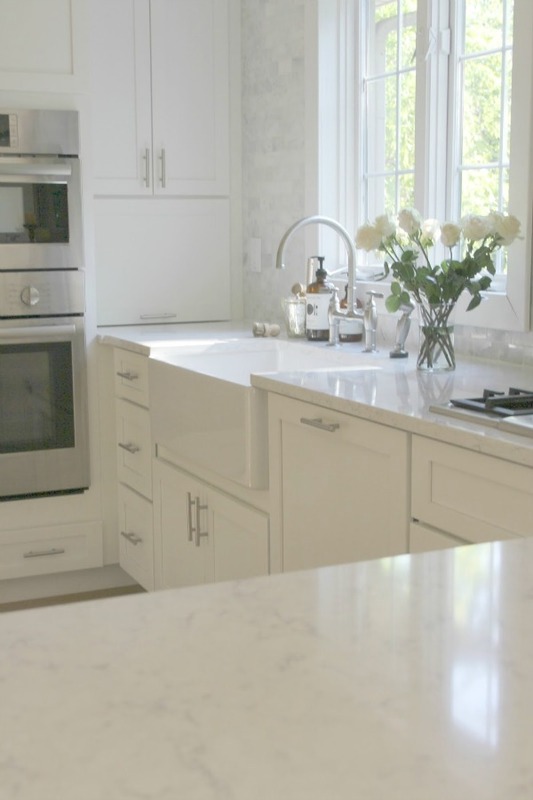 A polished carrara marble, venatino marble, statuary white marble, or calacatta marble tile backsplash can be a more elegant alternative to plain ol’ ceramic white subway tile. There are a couple of ways to get this effect: a mosaic tile with a sheet of marble tiles (this is how we achieved the look) or individual field tiles (which takes more time but lends itself to a multitude of different tile patterns). 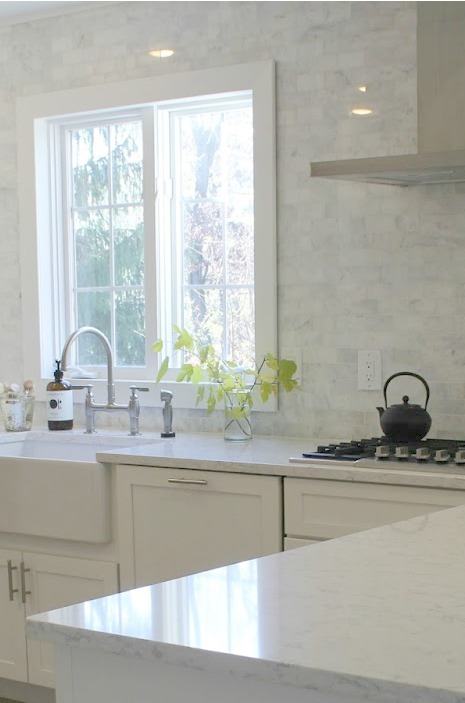 We did the job of tiling this wall in the kitchen ourselves, utilizing 12″ sheets of mosaic polished marble tile. 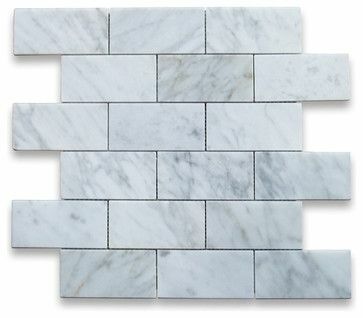 Polished Carrara Subway Mosaic: FIND HERE…certainly lovely indeed. 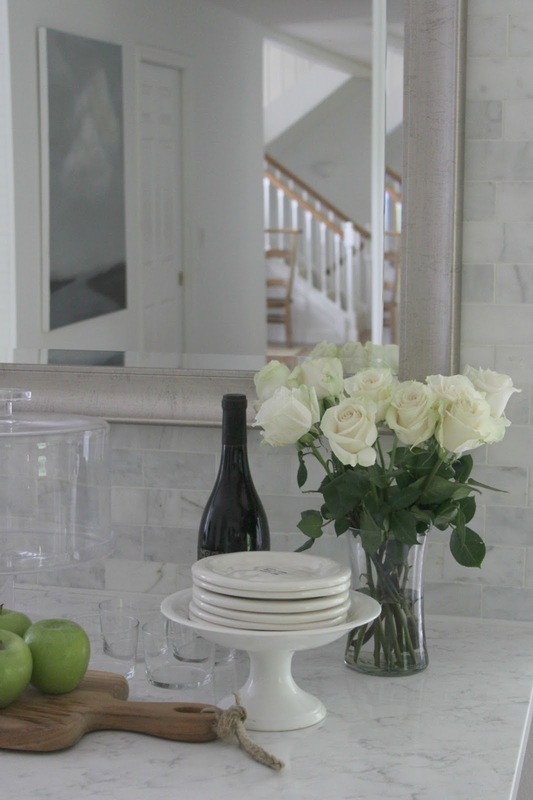 Honed marble tile backsplashes are also gorgeous, and it’s a highly subjective issue. I wanted to bounce the light around as much as possible so the polished tile wall made more sense. There is no worry about scratches since I’m not cutting vegetables on the wall and very few platters are hurled at it! I love those kitchen decor essentials that look beautiful but also work hard! 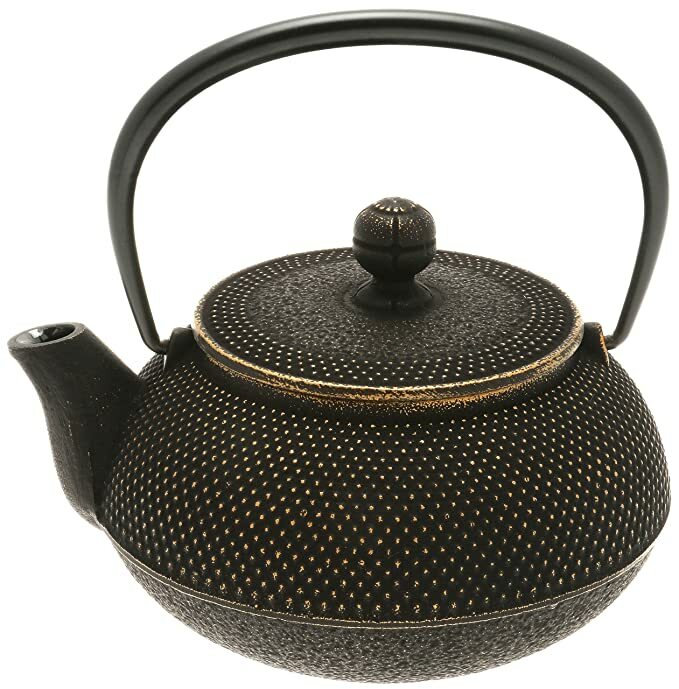 Japanese Iron Tesubin Teapot, Gold/Black…certainly lovely indeed. 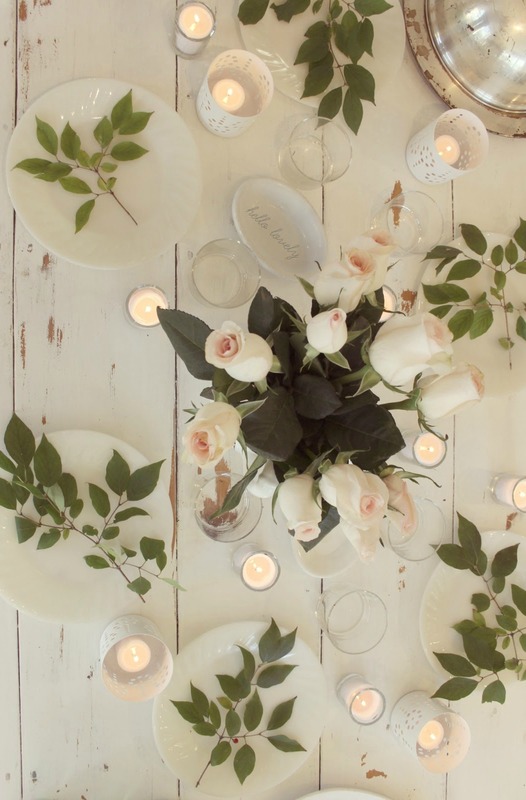 Still not tired of turned wood candle holders that have a rustic look and add romance to dining or just the everyday! 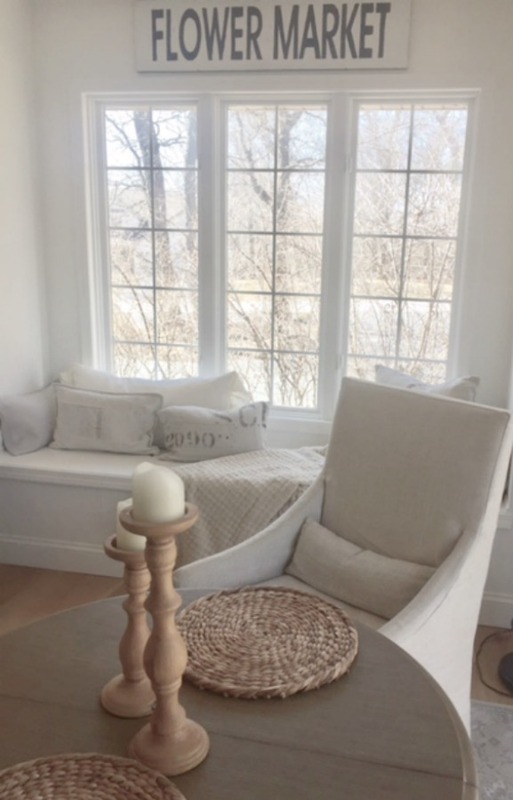 Scrubbed, bleached, aged, limed, stripped, and natural wood candlesticks look right at home in a French farmhouse, French country elegant kitchen, laid back California dining room, and rustic rooms of all types. 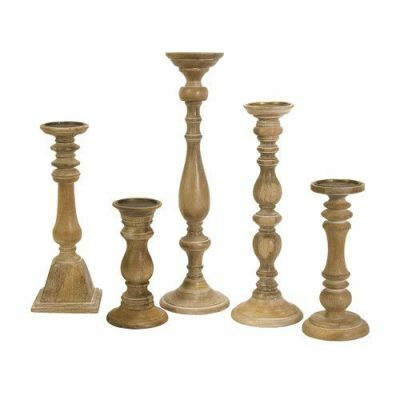 Rustic Wood Candlestick Set: FIND HERE…certainly lovely indeed. French Country Hosley Pillar Wood Candleholder…certainly lovely indeed. I love white walls! 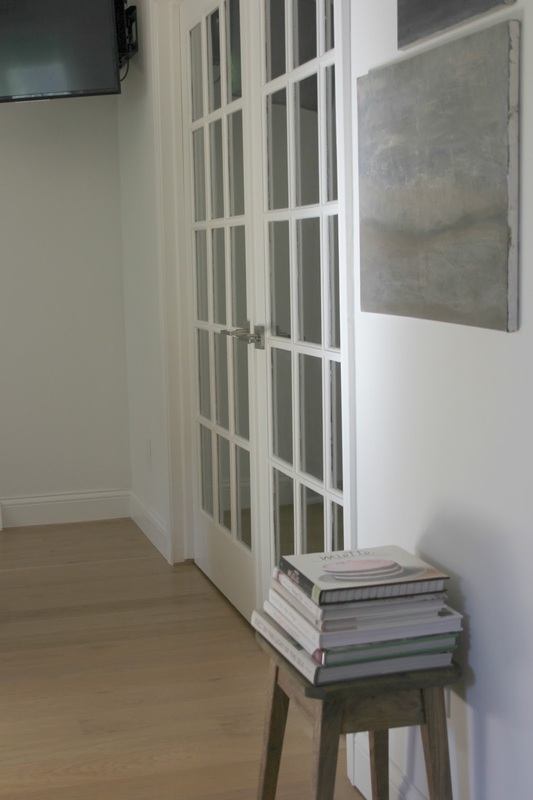 Read about choosing the right paint here. This reclaimed elm wood stool in the kitchen has been delivering all sorts of function and style for years, and I can’t imagine living without it. When you’re fun-sized like this fairy, you need the boost everyday! 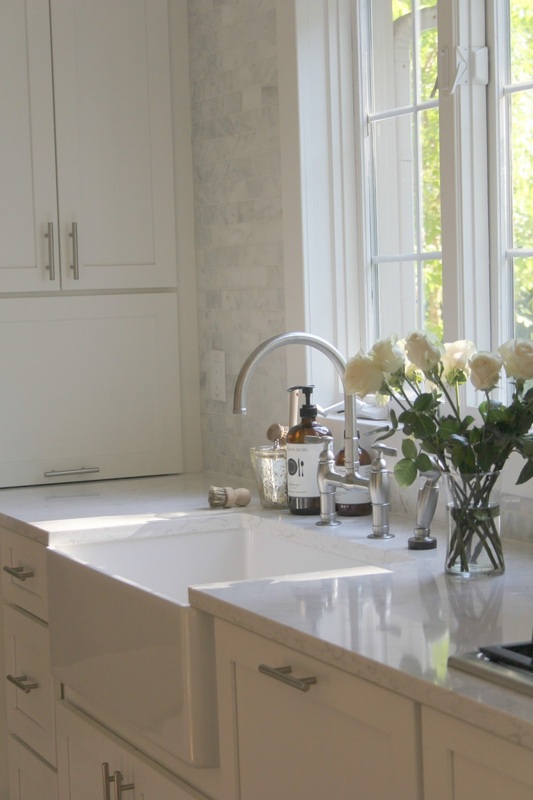 It adds rustic warmth and organic texture to a white on white kitchen which can read sterile all too easily. The stool also makes a smart perch for cookbooks, grocery bags, or even feet should you care to kick your feet up. This good looking stool is nearly identical. 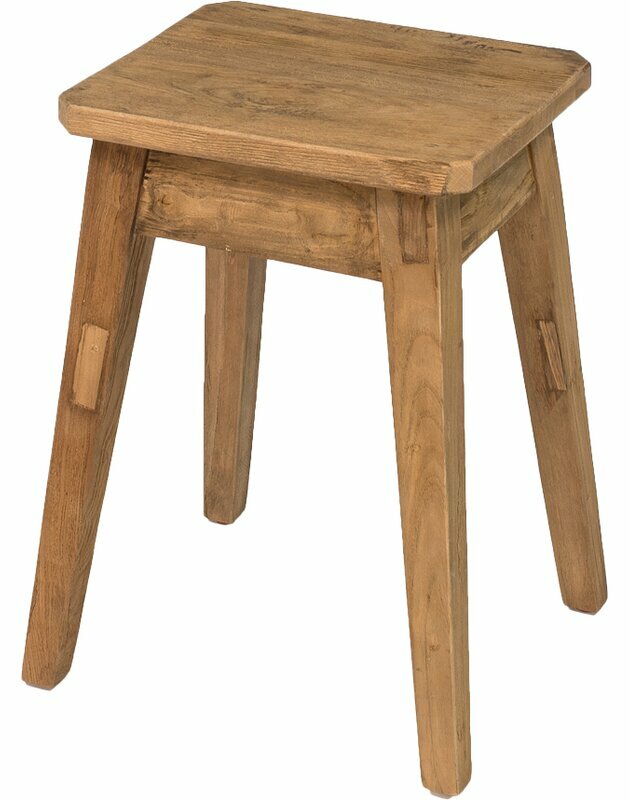 Oak Accent Stool…certainly lovely indeed. 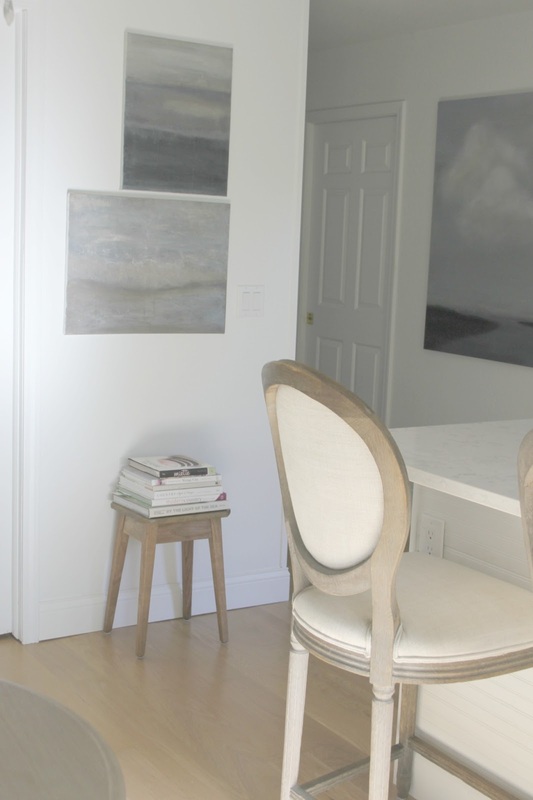 You can see below that abstract seascape paintings (the large one is by Melissa James Studio, the smaller two are by me) can also add warmth and interest to an all white kitchen. 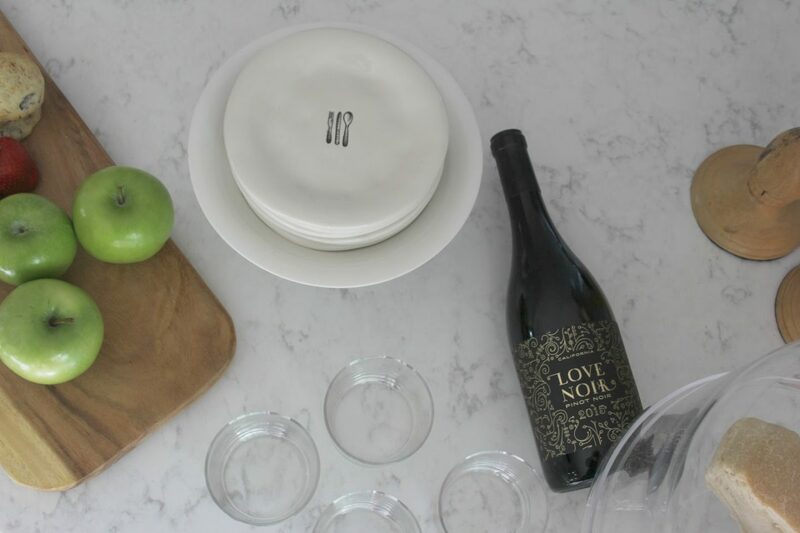 When you have limited cabinet space in a smaller kitchen, it helps to have tumblers (with a super simple, clean, modern design) like these which do double duty. 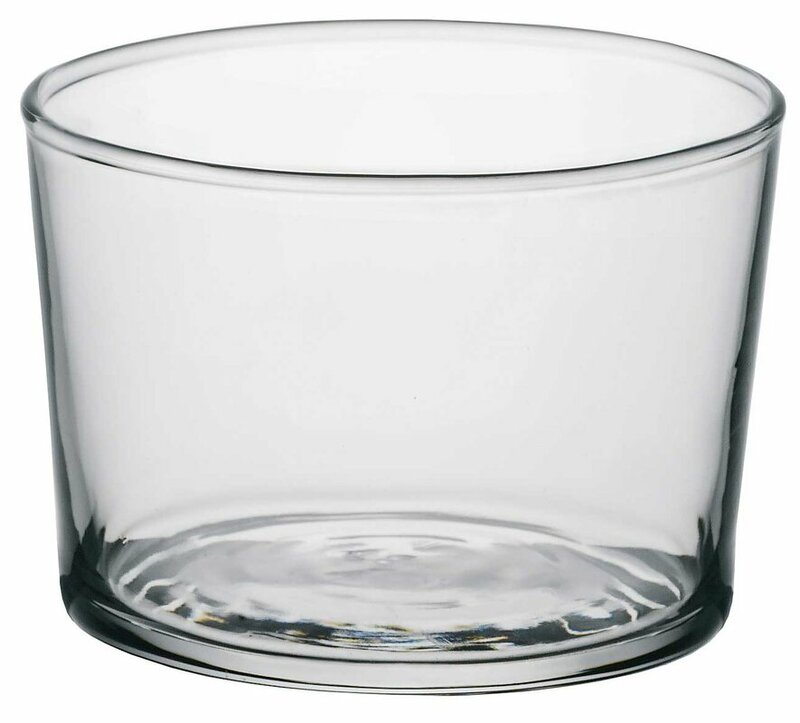 They work as little Spanish wine glasses, as dessert dishes, for serving yogurt, and as condiment receptacles. They can even hold votive candles! 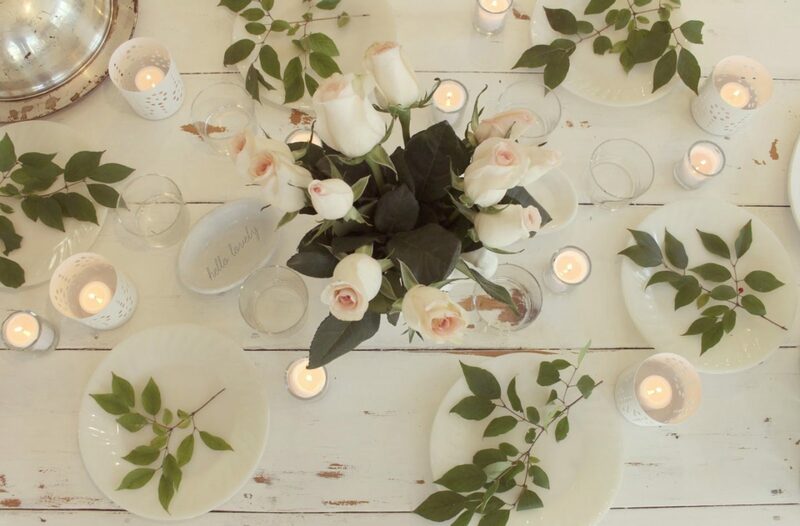 You’ll notice I worked them into a romantic tablescape from a few years back. 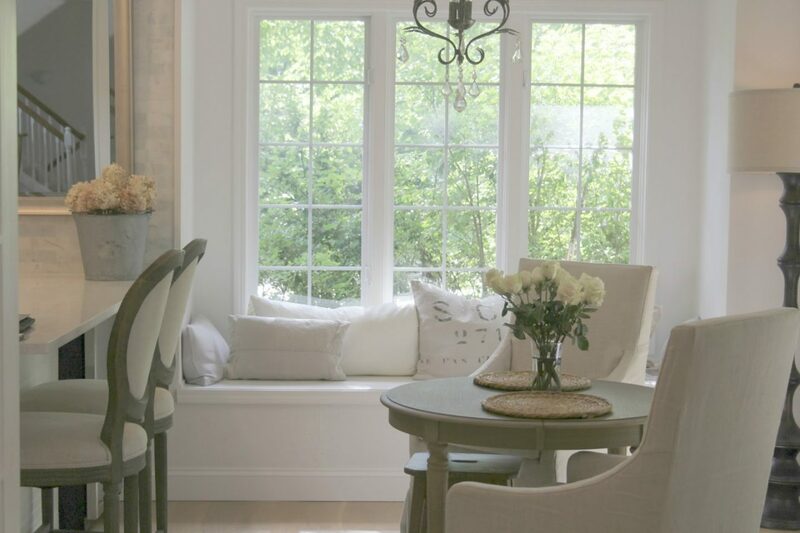 Another tip for adding texture and natural warmth to a kitchen with pale decor…woven placemats like thsese. Natural Water Hyacinth Weave Placemat Set…certainly lovely indeed. 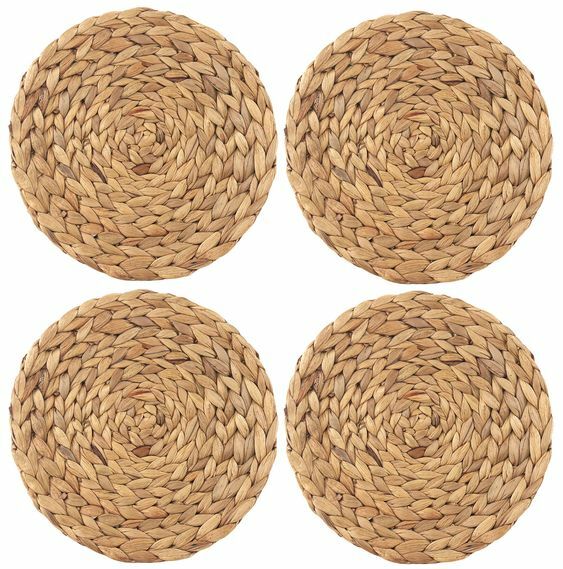 Woven Round Placemat Set of 4…certainly lovely indeed. Obviously the toaster made the cut when we were downsizing…who can live without it!?! Even though I eat less bread now, I still use it for toasting corn tortillas. And if you’re entertaining a small group, don’t forget you can toast slices of French bread in the toaster for crostini if you happen to be using your oven for other dishes or don’t want to heat up the oven! 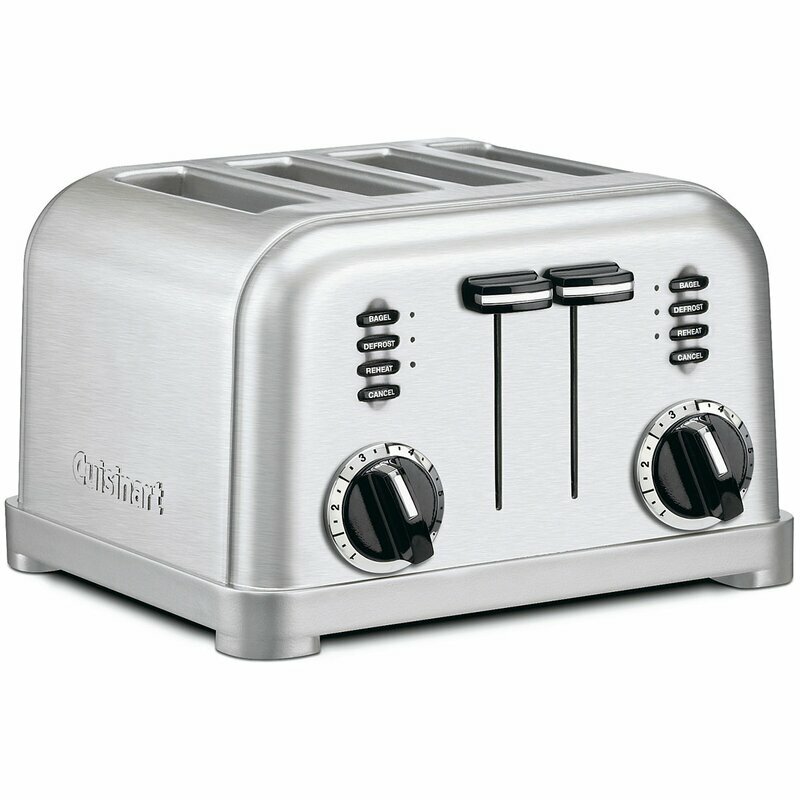 Classic 4-slice Toaster in Brushed Stainless: FIND HERE…certainly lovely indeed. This toaster is still my fav! I love heavy pans that do a beautiful job and last for many years. Here are my everyday ones. 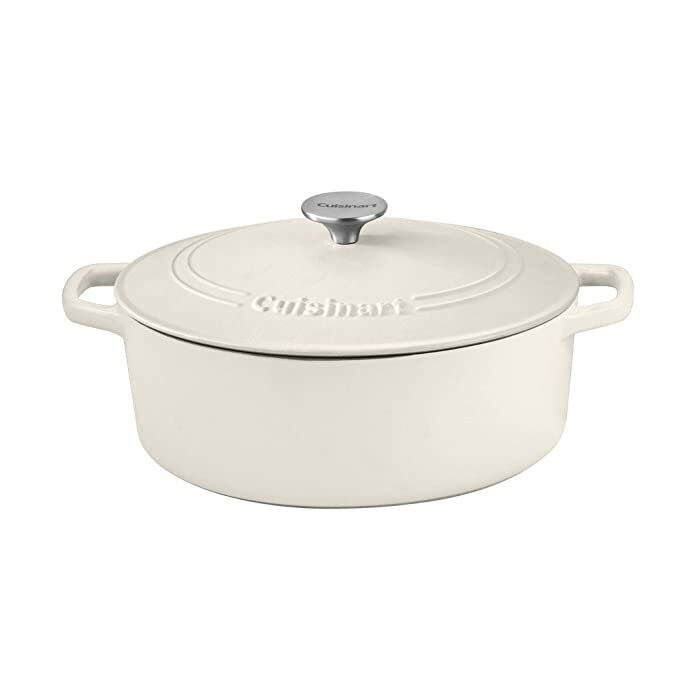 Cusinart White Casserole Enameled Pan…certainly lovely indeed. 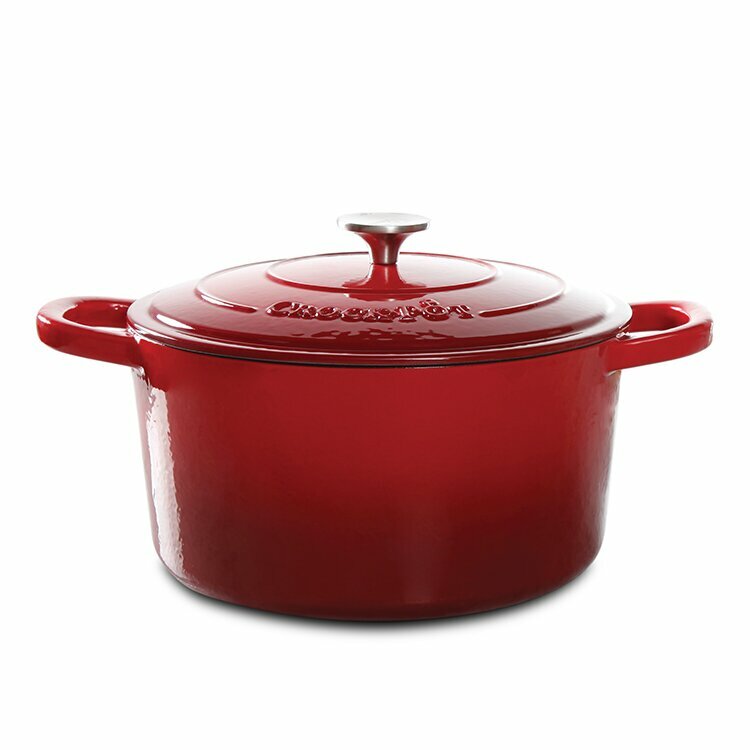 Artisan Round Dutch Oven With Lid…certainly lovely indeed. Grilling is an almost every day occurrence in my kitchen, and I rely on a good quality, nonstick grill pan to deliver delicious and healthy results. It cleans up so easily, and if you avoid putting it in the dishwasher, it will serve you well for many years. 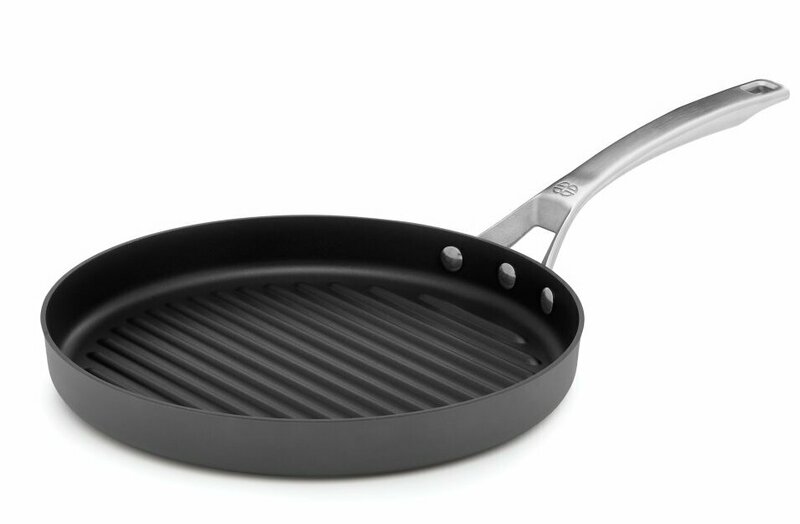 Round Nonstick Grill Pan: FIND HERE…certainly lovely indeed. When you are striving to eat a healthier diet with smoothies, vegetable juicing, and protein shakes, you can reach for a blender and maybe get a fair result. Or you can invest in a Vitamix and wonder how you ever settled for less. It’s a dream. I use it for batters and marvel at the efficiency. If you missed my Gluten-free flourless chocolate cake recipe, give it a whirl (see what I did there?). 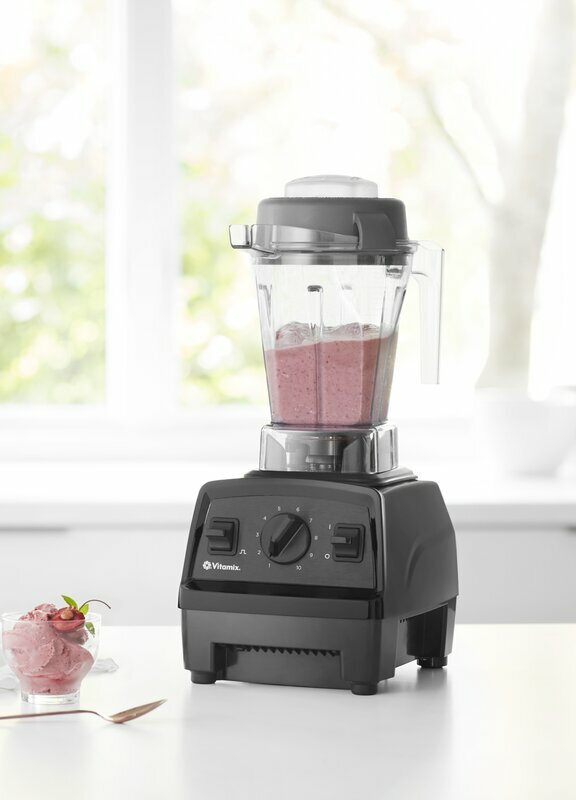 Vitamix Explorian Blender: FIND HERE…certainly lovely indeed. 15. I Love Striped Dish Towels! Crate & Barrel is still my favorite source of beautiful, quality, reasonably priced dish towels. Aster Stripe Dish Towels, Crate & Barrel…certainly lovely indeed. Pedro Stripe Fringe Dish Towel, Crate & Barrel…certainly lovely indeed. 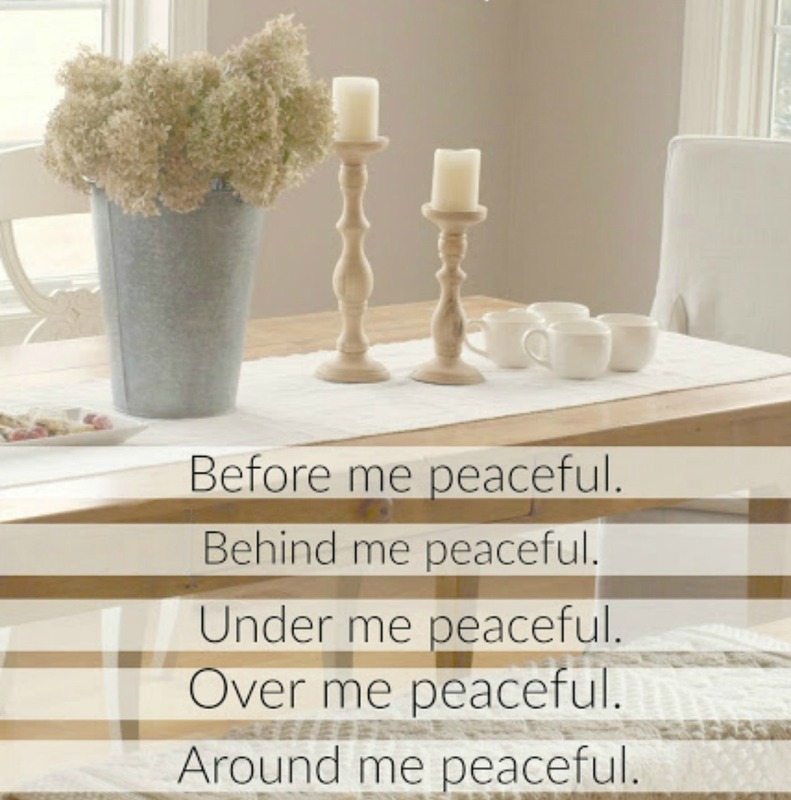 Myles Neutral Dish Towels, Crate & Barrel…certainly lovely indeed. 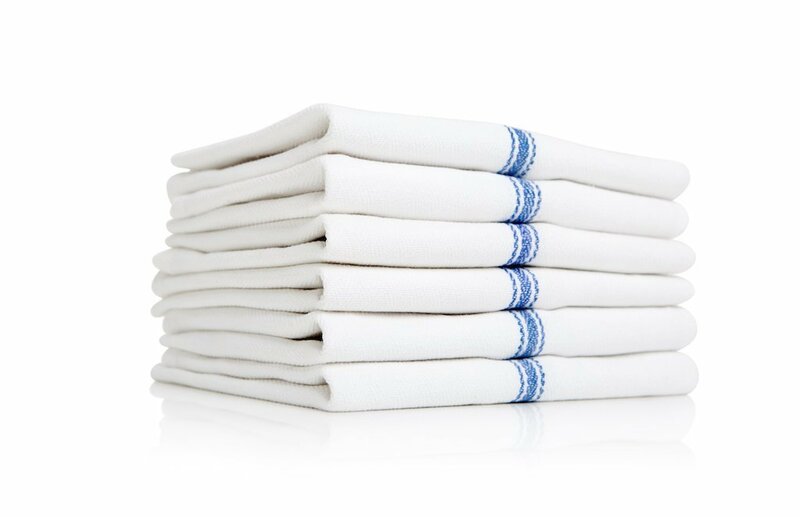 These towels below are super inexpensive and can serve as casual cloth napkins as well as dry dishes, mop counters, and housecleaning tasks. Love a European Farmhouse Style Kitchen? 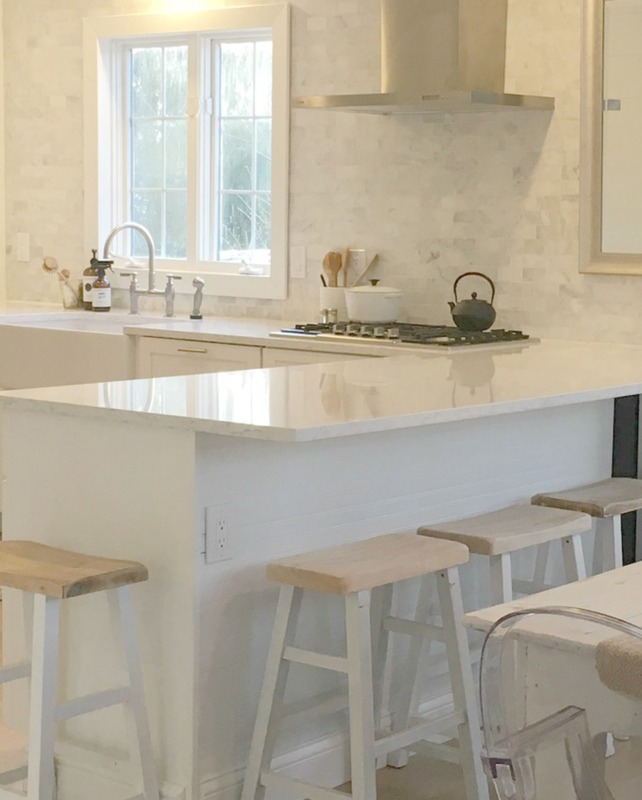 Joanna Gaines has designed her fair share of European country inspired kitchens, and here is a taste of how she approaches kitchen design. Michelle, I just love your kitchen. It is white-on-white perfection! So peaceful, so calming…an oasis of peace. I’m so flattered. Thank you very much and peace to you.